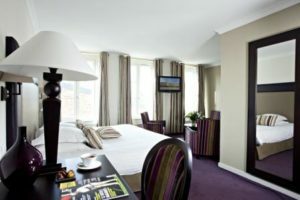 The hotel is located just over an hour’s drive from Calais, making it a perfect place to stop for a night or two en route to the Grape Escapes wine destinations. 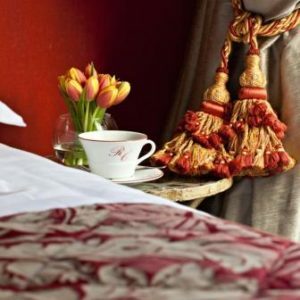 Situated in the very centre of Arras, the hotel is within walking distance of the TGV station, the two main squares and the UNESCO classified Belfroy. The hotel’s secure outside car park costs 10 Euros per night and can be paid for directly at check out. The bilingual staff at the hotel’s 24 hour reception desk are always happy to provide information about the town and suggestions for dinner in the evening. The hotel’s restaurant, Le Clusius is a real gastronomical gem, with an impressive wine list and for pre or post dinner drinks, the Saint-Vincent bar is open 24 hours. The buffet breakfast is served from 7am to 10am or alternatively, breakfast can be ordered to your room. Room service can also be enjoyed in your room and WIFI internet access is complimentary. Grape Escapes guests are accommodated in the superior-graded Luxe rooms, which are spacious and airy and decorated in an elegant, modern decor. Each room is equipped with a double or two twin beds, comfy arm chairs, a large wardrobe, LCD television, telephone, additional pillows and blankets, bath robes and slippers and a private bathroom with a bath and shower.